I hope you all had a lovely holiday and have set some awesome goals for the new year. I have almost finished my resolutions for 2015. I wanted to be more financially savvy with my money & to get on medical aid. So far I have completed a 2015 budget, now to stick to it. The medical aid has been applied for, so just waiting on confirmation. My other goals are still a bit top secret and are still a work in progress but I will share them closer to the time. A Lily Boutique Dress. I have fallen in love with their stuff. I am saving up to buy a few to make the $25.00 shipping fee worth it. They do Ship to South Africa so that is a plus. A DSLR Camera. I am still doing some price hunting on this but for sure it will be a gift for myself, maybe not on my birthday but definitely within this year! Katy Perry “Royal Revolution”. I love a good celebrity fragrance, I have worked my way through various Britney Spears ones and the “S” by Shakira perfume. It’s now time for a new chapter. A Yankee Candle. I have heard blogger after blogger rave about these candles, I now must have one. I would love a spicy or citrus scented one. Not a huge fan of sweet scents. The Clarisonic. I don’t even care which one! I just need to have this. My skin struggle is real and painful and I feel this is the ultimate tool to help me fight back. Again I have heard only good things about this specific brand. A Tangle Teezer. My hair is shorter now so I think this will be great for my bag. A Brightside Bubble Bar. This is my all time favorite bubble bar from LUSH. I love its smell hhmmmm. A Blackberry Bath Bomb. I have actually never tried this bath bomb before, it looks like it will be so good. *runs off to YouTube bath bomb in action. Colourful Teacups. I love tea and I would love to drink my tea in style and not a coffee mug. Although if its unique I would drink it out of a mug too. I’m not fussy. A Phillips Juicer. I like the shape of this one, it looks less bulky than all the others on the market. I like less bulky! Yoga Mat. Yip I am on a small new years health kick. I am busy learning about Pilates and need a mat. Figured here would be a great place to suggest it as an Idea. A Cloud 9. I think my GHD is dying, it won’t get as hot as it used to. That’s why I want a new straightner. My hair stylist uses a cloud 9 on my hair and its magical! My hair is so straight after she does it. So that’s my wishlist, working hard to have all the things, it might take time but its always great to have something to work towards. 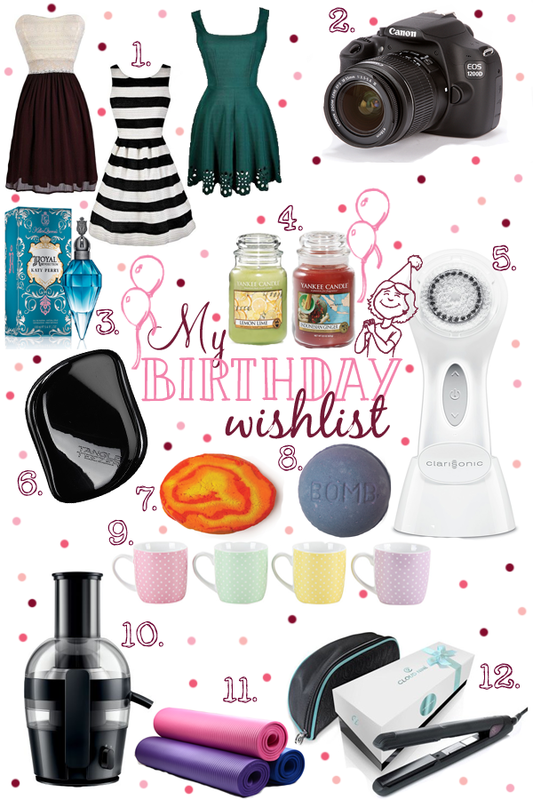 This entry was posted in About Me, Wish List and tagged South Africa, South african blogger, Wishlist. Bookmark the permalink.